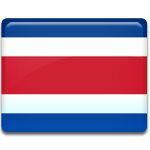 Our Lady of the Angels Day is a public holiday in Costa Rica celebrated on August 2. It is the feast day of Virgen de los Angeles (the Virgin of the Angels or Our Lady of the Angels), the patron saint of Costa Rica. According to tradition, a peasant girl found a small stone statuette of the Virgin Mary holding the infant Jesus on August 2, 1635. She tried to take it home, but the statuette miraculously reappeared on the spot where it had been found. Then townspeople decided to built a shrine around it. The Basílica de Nuestra Señora de los Ángeles (Basilica of Our Lady of the Angels) was built in 1639. It is situated in the city of Cartago. At some point it was partially destroyed by an earthquake. The current building was completed in 1924. The original statue is kept at the main altar inside the basilica. It is sometimes affectionately referred to as La Nergita due to its pale complexion. Another name of the statue is Queen of Cartago (Reina de Cartago). In 1824, the Virgin of the Angels was declared the patron saint of Costa Rica by an official decree. The anniversary of the statuette's discovery was proclaimed as a public holiday. On this day, pilgrims from all over the country come to Cartago to visit the basilica.